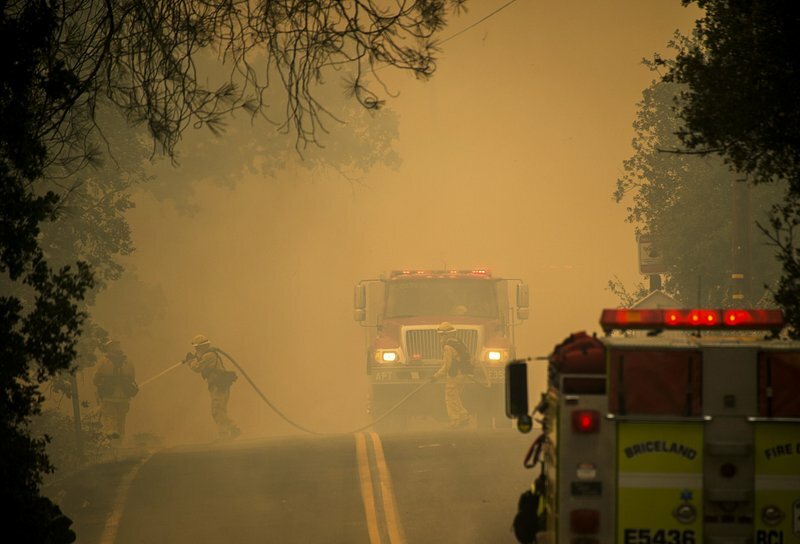 Wildfires are ravaging rural Northern California as winds drive the blazes into communities and destroying buildings. The wind-driven flames are threatening hundreds of more homes Sunday as the fires continued to race through the dry brush. The Pawnee Fire started Saturday by Clearlake Oaks and has destroyed 12 buildings with an additional 600 still at risk in a 12 square mile area. California officials have ordered mandatory evacuations of all homes in the Spring Valley area which is home to around 3,000 people. Chief Jonathan Cox of the Department of Forestry and Fire Protection Battalion said, "What we’re stressing is that people when they get the evacuation order, they heed it immediately and get out and stay out until it is safe to return. This is one of four large fires burning in Northern California. It’s a good reminder that fire season is upon us." Strong winds combined with a heat wave has been creating the perfect scenario for wildfires in a large section of California from San Jose all the way up to Oregon. This region is just north of the wine country where the devastating wildfires from October killed 44 people and destroyed thousands of buildings. Another fire currently burning in the Tehama County area has already destroyed "multiple residential and commercial buildings," according to Cal Fire. Firefighters have been making progress to maintain this smaller fire which spans about three-quarters of a mile and some evacuees were even allowed to return home. A third fire, this one also in Tehama County, burned about 5.5 square miles but no buildings were destroyed. Another fire dubbed the Lane Fire is threatening around 200 buildings and some homes were evacuated. Lane Fire is currently about 10 percent contained. Another fire in a neighboring county of Shasta reached a span of 1.6 square miles and is currently 20 percent contained. Another blaze called the Creek Fire did not damage any buildings but did require some to be evacuated. The exact cause of each fire is unknown but is being investigated. No injuries were reported with over 230 firefighters, helicopters, and bulldozers battling the blazes. Here is a job for all those 100's and 1000's of Homeless (Note: New PC term = Urban Campers) and Illegals.